“The simple answer is everyone, to some extent,” Judy said enthusiastically. Judy looks at the body holistically and analyses which systems aren’t functioning properly. “I then apply one of several chiropractic techniques which use a gentle and holistic approach to healing. They help your brain to function at its best, so you heal from the inside out,” said Judy. Judy said to imagine your brain as a circuit board, with pathways for controlling everything that happens in your brain and body. “When we get stressed, the circuits become disconnected, similar to blowing a fuse,” Judy explained. Physical stress from injury, poor posture, prolonged sitting, or even simple, repetitive actions, which cause injury. Chemical stress in the form of bad food choices, poor quality air and water, or even imbalances due to poor absorption of food. Emotional stress from anxiety, stress of daily living, or an overly busy workday. “Original problems can disrupt the whole system such as a sore shoulder working its way up to your neck, causing headaches, sleep disruption and a sore belly,” said Judy. “My training allows me to make the connections between the master regulator, the brain, and the body function which is out of balance.” The most common conditions seen at Optimal Health office are; sciatica and lower back pain, shoulder pain, headaches, learning difficulties, neck pain and stiffness, eczema, immune function, fatigue, joint pain, anxiety and digestive dysfunction. “It’s important to understand that symptoms are warning signs of something wrong. 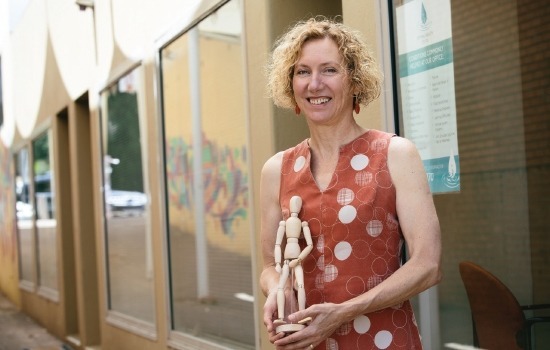 We can dig out the underlying cause of the symptoms and reconnect the proper system to optimise your health,” Judy said. Judy has enjoyed the last four years at the Ainslie shops and hopes to enjoy many more years providing her services to the people of Ainslie.